Purchasing this item will earn you 126 reward points (Loyalty points $1.26) ! Bluebonnet’s Beautiful Ally Keratin Care Capsules are specially formulated with Cynatine HNS, a clincially-studied, bioactive, solubilized keratin- along with biotin, resveratrol, vitamin A and a unique amino acid blend- to help promote the appearance of strong, gorgeous hair. Bluebonnet’s Beautiful Ally Keratin Care Capsules are specially formulated with Cynatine HNS, a clinically-studied, bioactive, solubilized keratin- along with biotin, resveratrol, vitamin A and a unique amino acid blend- to help promote the appearance of strong, gorgeous hair. This restorative hair care formula helps protect and repair damaged hair from the inside out. Available in easy-to-swallow vegetable capsules for maximum assimilation and absorption. 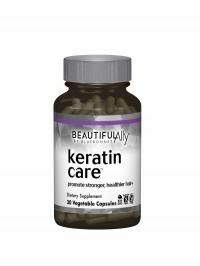 Beautiful Ally is a registered trademark of Bluebonnet Nutrition Corporation Keratin Care is a trademark of Bluebonnet Nutrition Corporation.